Kickass McAwesome: Comic Review: Harvest Moon: Sunshine Islands. Comic Review: Harvest Moon: Sunshine Islands. In the on-going war between making the comic, raiding two nights a week, and sleep, sleep has lost yet again. Though in retrospect, it probably shouldn't lose as often as it does, but I digress. On with today's comic! Harvest Moon has been one of my favorite game series for quite some time. I've played pretty much every game in the series since it first started on the Super Nintendo in 1995. A farm/life simulator is pretty much as niche a game as you can get, but Harvest Moon certainly has found an audience as over a dozen games in the series have been released with no signs of stopping. I enjoy the game so much I actually only played that stupid FarmVille game on Facebook 'cause it reminded me of Harvest Moon. But trust me when I say it is no Harvest Moon. I recently picked up the lastest game in the series, Sunshine Islands for the DS, and thankfully it doesn't rely completely on touch screen controls (I'm looking at you, Island of Happiness). 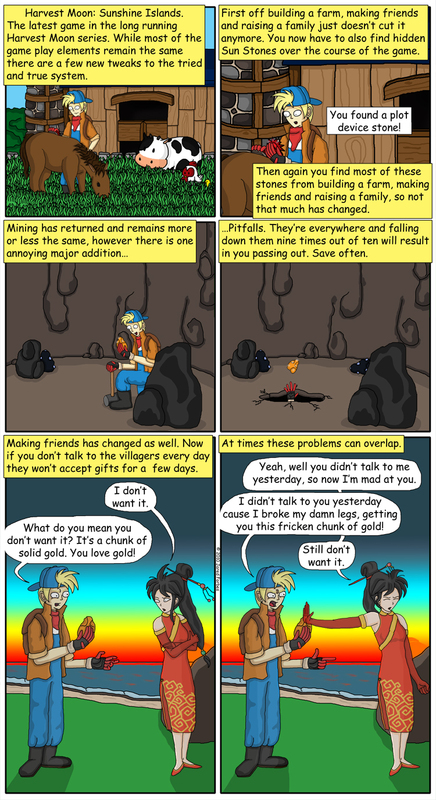 As a veteran Harvest Moon player, it was easy to get into, much of the basic game design hasn't deviated from the original game made fifteen years ago, but there are a few glaring changes that have been made, thus this comic. Also, mind you, that while the comic is mostly negative, this game is in no way bad, just takes some getting used to, especially if you're used to the older games. In fact, after I got used to the few changes, I honestly can say it's one of the best in the series. Hands down the best on the DS. One more side note. Before, I mentioned the niche audiance of the Harvest Moon games, and from what I gathered on the forums for Sunshine Island, the audiance is pretty much all female, I think I was the only dude on the forums. So, ladies, if your interests include farm/life simulation games and happen to be availible, give me a buzz. I'm just a Rick looking for his Karen, a Mark looking for his Chelsea.